John Hammond (Richard Attenborough), CEO of the genetic engineering company InGen, is a true visionary. Though his reach often far exceeds his grasp, he’s never been one to reign himself in. One such case is his latest endeavor. He hopes to create a theme park featuring real dinosaurs. The geneticists under his employ allow him to realize this dream. However, a tragic accident involving one of the beasts gives his benefactors pause. In order to put them at ease, he invites paleontologist Dr. Alan Grant (Sam Neill), paleobotanist Dr. Ellie Sattler (Laura Dern), Mathematician Dr. Ian Malcolm (Jeff Goldblum), and attorney Donald Gennaro (Martin Ferrero) to his park. With their endorsement, things will continue as planned. Alas, an act of sabotage causes their excursion to take deadly turn. Suddenly, the island’s prehistoric inhabitants are allowed free range of the park, and all human beings become subject to the laws of a long forgotten age. 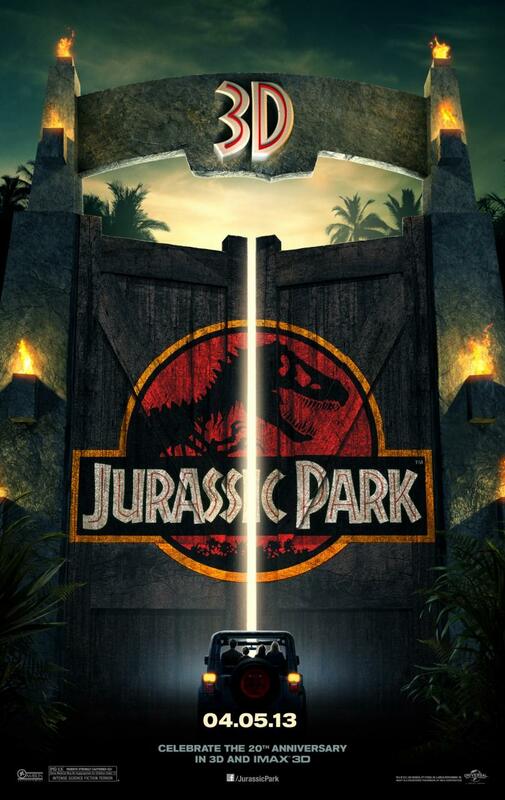 20 years ago, Jurassic Park helped usher the summer blockbuster into the digital age. It also reestablished Spielberg the preeminent showman of modern cinema. Now, the film is being given the three dimensional treatment via post conversion. It’s also being given yet another go around on multiplex screens, conceivably to push its worldwide box office take past the billion dollar mark. This has become standard practice for a number of all-time box office hits released during the 1990’s. Jurassic Park is one of the most accomplished entertainments of that particular decade. However, do modern gimmicks serve to enhance its already considerable appeal, or tarnish its legacy? Among Jurassic Park’s considerable assets was its tropic locale. Dean Cundey gave a bit of 90’s gloss to the Hawaiian island of Kaua’I, all the while maintaining Spielberg’s penchant for epic grandeur. The mountain vistas and plant life feel every bit as alive and voracious as the animals on display. This environment seems to thrive in a way that the modern world does not. The film displays the very real dangers of such a place while maintaining the sense of awe and wonder so vital to a film of this type. The film’s look seems to morph somewhat to accommodate the species of dinosaur being featured at any given moment. The Brontosaurus is peaceful yet somehow majestic. The infamous T-Rex is given an introduction worthy of King Kong. If only current blockbusters possessed such visual dexterity. Back in 1993, Jurassic Park’s key selling point was the dinosaurs. Thankfully, that aspect of the film holds up remarkably well. They were brought to life via groundbreaking special FX courtesy of Industrial Light & Magic. Jurassic Park managed to blaze new trails with CGI technology (then still in its infancy) without using it as a crutch. A variety of techniques were used, from robotics to animatronics. The results are about as close to seamless as one could hope for. The set-pieces on display are easily among the most effective in Spielberg’s oeuvre, which is to say they are some of the greatest in film history. The aforementioned introduction of the T-Rex remains a breathless and spellbinding moment. The visual of its eye peering into the driver’s side of the van and gazing upon its terrified prey is enough to make anyone’s blood run cold. It reveals Spielberg’s mastery of cinematic language in no uncertain terms. The fact that the sequence does its job without the help of John William’s bombastic score further drives the point home. Spielberg doesn’t need grandiose music or excessive dialogue. He is able to convey every bit of necessary information through the visuals alone. How many filmmakers can say that? The 3D post conversion process neither helps nor hinders the film. After the opening moments of the first act, the viewer’s eyes begin to adjust to the three-dimensional effect. By the middle of the second act, it’s barely noticeable. However, there are brief and fleeting moments where the technique has the desired effect. As the T-Rex steps over the partition and through the severed cables during its initial attack, it truly stands out from the background as though seen through a View-Master. Unfortunately, such moments are few and far between, rendering the process as an extraneous indulgence. Jurassic Park remains as glorious a thrill ride as it was 20 years ago. Dare I say it has joined the ranks of Raiders of the Lost Ark, Star Wars, and Jaws in that regard. The film does its job brilliantly, with nary a slip or stumble along the way. It also happens to be the last truly great adventure that Spielberg ever crafted. That is fitting, as I can’t imagine him ever topping it. In a world where blockbusters become more bloated and pretentious with every passing year, Jurassic Park harkens back to a more classical sensibility. I liken Spielberg to Hammond himself. He’s a man with big ideas, who only wants to please his audience. However, in Spielberg’s case, the audience is always in capable hands. He’s in total control every step of the way. My 1st Movie was Lost World ... 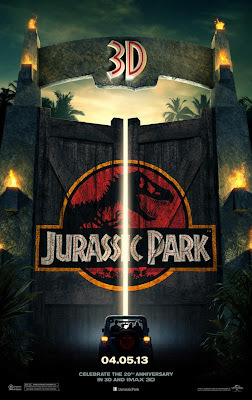 But i got to see this in 3D ... that Soundtrack of Jurassic Park will give peace to me and T Rex to scare ..... Cant wait to bring back my Childhood !! !